To access this video, please fill out the form below. Your IAM is Obsolete. Now What? 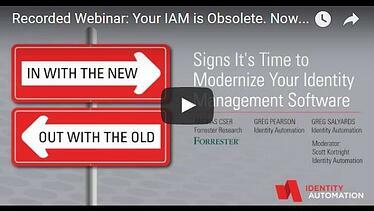 Increasing adoption of cloud-based apps and BYOD policies, evolving security threats, complex business processes, growing numbers of external users—first-wave, legacy IAM systems simply weren’t designed to meet the needs of today’s digitally dependent enterprise. While a growing number of full-featured, third-wave IAM solutions are available, how do you determine which best fits your organization?